The Cooper's Hawk is a short wing hawk in the accipiter family that is known for it's short range but explosive flights. They are commonly flown as imprints or sore hawks, however flying passage coopers is becoming more common as time goes on. The coopers hawk quarry is from sparrow and starling up to pigeon and pheasant. Occasionally in the western side of the country rabbit hawking is common, however the increased size of the eastern rabbits make it a hard endeavor for all but the largest female. A common opinion, of which my experiences matches, is that the coopers hawk needs a large amount of stimulus. This can be provided in multiple ways, however consistent and daily hunting seems to be the key. A quote, although I can't remember where I read it, that is fitting to this is that: "Accipiters are for the people who are going to fly them every damn day.". 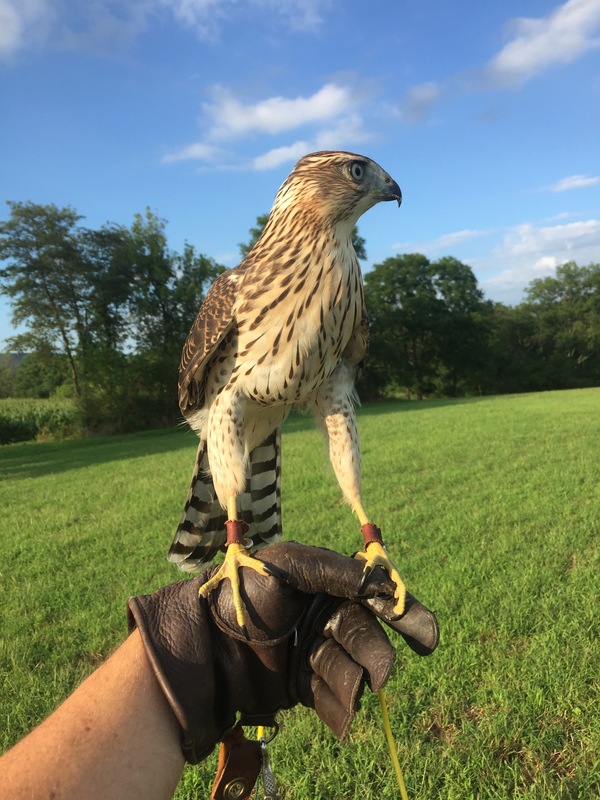 Another key piece of information I was provided by Rob Giroux when starting a cooper hawk is that "You can make a lot of mistakes with other birds and they seem to simply forget or move on in short order, the cooper's hawk will unpleasantly remind you of them for months". The cooper's hawk seems to have a thing for making you remember every little mistake you make in the training process. 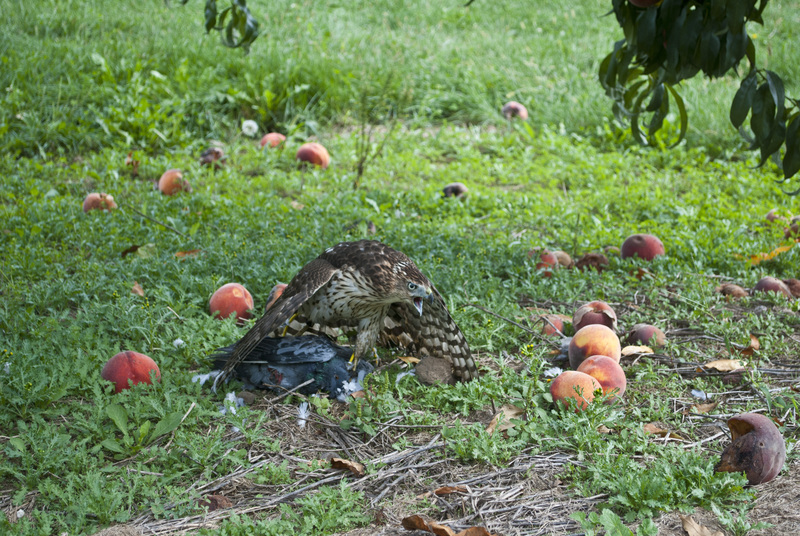 The opposing picture is of the same female coopers hawk after catching a pigeon at a dairy farm. As an imprint she was often vocal on quarry. 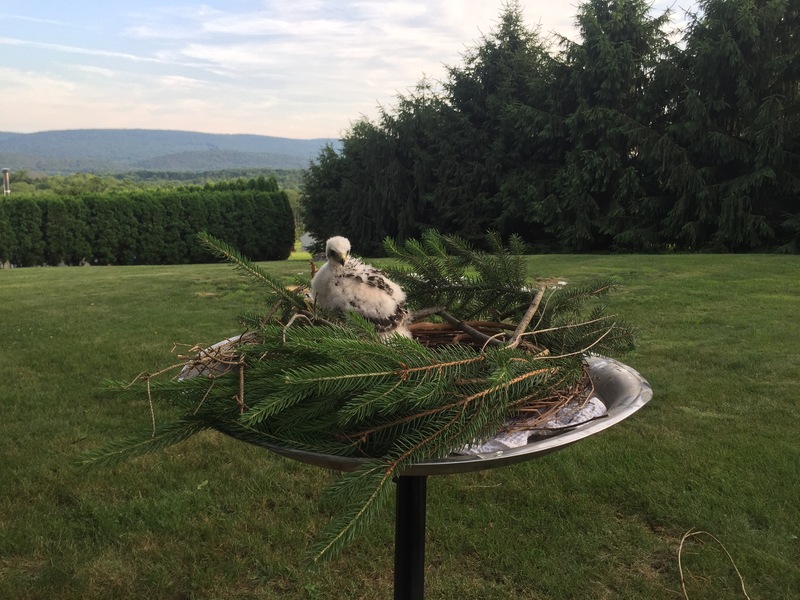 One of the most rewarding parts of accipiters is often raising an eyas. To be able to be involved in the direct development of a bird is an experience that can't be compared to anything. It can be both rewarding and trying in the same 30 seconds. But nothing quite matches the feeling when that bird takes it's first head of game with you. To the right is a picture of the bird as the first feathers started pushing through the down. I used an old parrot perch stand with the perch removed as the nest base. I then formed a nest with an old wreath and wrapped it in fresh pine.